During the past 15 years, there has been a considerable increase in the share of air travel within Europe that is carried out by low-cost airlines. These new airlines apply the most drastic cost saving measures in order to drive air fares down to a minimum. 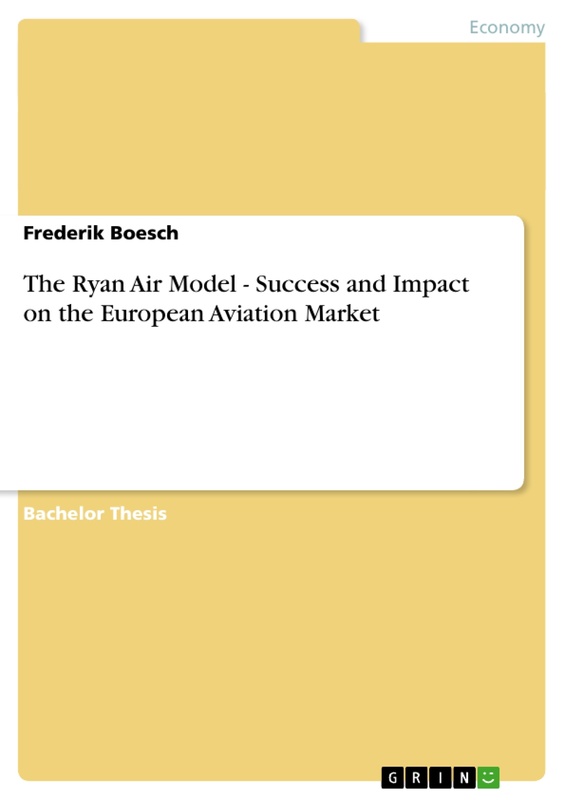 This paper will first explore the deregulation process of the European aviation market which was the precondition for the emergence of low-fare carriers in the early 1990s. It will then take a closer look at Ryanair, the current low-cost leader in Europe and describe its history, the elements of this distinct business model, its successes, and also some limitations. The last part of the paper will concentrate on the impact that low-fare airlines like Ryanair have on the aviation market. It will explore the changes on the market that can be expected in the long-run and will pay attention to the question if and how traditional full service carriers can respond to the increased competition. The European aviation market has for decades been determined by a handful of national carriers and their respective governments. For about 15 years now, however, airlines with a completely new business concept have been entering and penetrating the market; offering an alternative model of air transport. These so called low-fare airlines (LFAs) can be defined as an “airline that offers low fares but eliminates most traditional passenger services”. In comparison national carriers, also referred to as full service or network carriers are airlines that are usually supported or even subsidized by their respective governments and offer a variety of services to their passengers. These airlines are normally characterized by high ticket prices. Traditionally the margin of profit has been very low for most established airlines and due to the appearance of LFAs in the market, the competition for market share has further increased. In order to stay competitive, costs have to be kept to a minimum. LFAs have been highly successful in introducing various cost reduction measures like uniform fleet structures, point-to-point services, the using of secondary airports, or performance-related pay schemes. These cost-saving techniques are the fundamental elements of the LFA business model. As a result profit margins and return on assets in the low-fare business are among the highest in the market. When it comes to flying, most customers are very price sensitive which means that demand for air travel is highly elastic. Since by reducing prices the sales would rise sharply, price wars are common in the airline industry. The low costs and fare prices of the LFAs do pose a major threat to the traditional full service carriers as they cannot, for numerous reasons outlined in this paper, simply adopt the cost saving measures developed by the LFAs. Today the US market leader is Southwest Airlines and the European leader is Ryanair. These two airlines have developed as the most effective cost and price competitors in the business and are furthermore the most consistently profitable airlines in the world. They even proved to be highly robust in times of economic crisis and market decline (Lawton 2002). There are numerous questions about LFAs today. Why are they so successful? Will they be able to remain profitable and competitive in the long-run? What will happen to the airline market in the future? This paper will try to give an answer to these questions by taking a closer look at Ryanair. It will start out by describing the preconditions of the emergence of LFAs in Europe. It will then briefly talk about the emergence of Southwest Airlines in the United States as this was the first true low-cost airline in the world. Afterwards attention will be paid to the emergence in Europe; why it was considerably late and why it all started in the UK and Ireland. The next section will focus on Ryanair, its history, business model, success in the market, and also some limitations. The last part will be more general and talk about the impacts that airlines like Ryanair have on the European aviation market. The paper will then be concluded by a brief look at the emergence of LFAs outside of the US and Europe and a short conclusion. Traditionally the aviation market in Europe was purely national and controlled by the national carriers and their respective governments. In order to be competitive and achieve some kind of a monopoly, these airlines were often heavily protected by the governments. As a result the market was not working efficiently and the passengers had eventually to carry the additional costs. European airfares were repeatedly the highest in the world (Barrett 2003). Whenever new and cheaper airlines tried to enter the market, they faced hostilities by the existing airlines and were, most of the time, driven out of the market. By the mid 1980s the European governments realised that this interventionist policy was no longer tenable (Lawton 2002). Doganis (1991) argued that this process was precipitated by mounting pressures emanating from consumer groups, the European Parliament, and the European Commission. The move towards a more liberal European policy for airlines began in 1984 with a bilateral agreement between Britain and the Netherlands to open up their markets (Button and Swann 1989). The deregulation of air services between these two countries can be seen as one of the first steps towards a European-wide airline deregulation process and marked a significant break from the past which was mainly characterised by state intervention. Similar bilateral agreements between other countries in the EU followed soon thereafter. These bilateral agreements then paved the way for a multilateral liberalization at a European level in the late 1980s (Lawton 2002). The “objectives of this movement were to liberalize existing intra-European air traffic and to open up heavily protected national air transport markets” (Doganis 1991, p.83). This subsequently aimed at opening up the European airline market to greater internal competition. The competence has been moved to Brussels in a number of areas and now the European Union instead of the nation states is controlling the instruments for regulating the airline market. Each airline with a valid air operations certificate can operate within the EU at market-determined prices (Gillen and Lall 2003). As a result there are today increased levels of competition in Europe. After this process of deregulation large numbers of new airlines, among them the LFAs, were able to enter the market under favourable conditions and are now competing for market share. The dominance of national carriers has been weakened, price competition is growing, and competition on international routes is increasing. Since the deregulation process of the airline industry in the United States took place much earlier than it did in Europe, the first airline applying a low-cost/ low-fare business model was based in the US. The LFA pioneer Southwest Airlines began its service in 1971 and has been profitable every year since 1973. According to Lawton (2002) it is the US’s only major short-haul, low fare, high frequency, point-to-point carrier. Southwest does not offer meals (just drinks and peanuts), assigned seating, interline baggage checking, or a premium class of service. It furthermore uses a standardized fleet of Boeing 737s and places considerable emphasis on corporate culture as vital ingredient for their success. From the beginning onwards their revenue generation was based on a system of maximising the number of passengers rather than yield per passenger. This was a revolutionary approach in the airline business in the 1970s. By applying this strategy Southwest has achieved a sustainable comparative advantage. Today it is flying over 65 million passengers a year which makes it one of the biggest US airlines. Furthermore Southwest estimates that it provides approximately 90 per cent of all low-fare airline traffic in the United States. The Southwest concept also proved to be highly successful in times of crisis and in the aftermath of the September 11 attacks its market capitalization exceeded that of all major US airlines put together (Gillen and Lall 2003). Compared to the United States, the emergence of LFAs in Europe was a rather late phenomenon. This was mainly due to the fact that until the late 1980s few national carriers controlled the European aviation market. As already described above, these national carriers were highly protected by their countries and received large subsidies. Additionally airports did act mainly in the interest of the well established airlines. These two facts, among some others, made it very difficult for new airlines to evolve before the 1980s because there were high start up costs in addition to a hostile microenvironment. As pointed out above, only after the deregulation of the market in Europe was it possible for new, innovative airlines to enter it. Since the deregulation took place so late compared to the US, LFAs only did emerge in the late 1980s/ early 1990s (Lawton 2002). A second reason might as well have been that the US market consisted of only one nation while the European market was made up by a large number of countries. This resulted in much higher transaction costs for the Europeans due to international barriers. In the late 1990s there existed five true low-fare airlines in Europe. Go, Buzz, and easyJet were based in the UK , Ryanair in Ireland and Virgin Express in Belgium. This raises the question why four out of these five LFAs were situated in Ireland and the UK. According to Lawton (2002) this was no coincidence and there are several factors that support his argument. First, there is the island factor. International travel by car is not that easy and expensive ferryboats or tunnel trains have to be used. Secondly, the UK is the biggest leisure air travel market in Europe. This translates into a large demand for low-budget flights and a considerable market potential for LFAs. Thirdly, there are many ties between the UK and Ireland as they are economically closely connected. The so called “visiting friends and relatives” market is very important for those two countries. Fourth, there is a technological advantage in the UK. Credit card use, internet access, and online purchasing was already strong in the mid 1990s but not so much in continental Europe. Fifth, there is a correlation between risk capital and culture and the emergence of LFAs. The UK historically has the most entrepreneurial culture in Europe. Finally, the British workforce is more flexible than in many other European countries. The UK has the most liberal labour regime in the EU, for instance unions are by far not as strong as in France where pilots are on strike quite frequently. These factors can in part explain why the first LFAs emerged on the British Isles. With the advent of full airline liberation in Europe a large number of new airline start-ups emerged within the European Union. The leader of these start-ups was the Irish-based low-fare airline Ryanair. The company was founded in 1985 and was in its early years very successful in offering cheap services between London and Dublin and had huge passenger increases each year. However, it did not well in managing its costs. From 1985 to 1991 the airline made constant losses with the exception of 1987 (Gillen and Lall 2003). By 1991 a new management team was brought in and restructured Ryanair completely by closely modelling the Southwest Airlines model. By doing this Ryanair became the first true low-fare airline in Europe. The Irish managers, however, even carried the Southwest model further by offering no drinks and snacks at all and abolishing the frequent-flyer program which Southwest up to this day offers its customers (Gillen and Lall 2003). By offering low prices and traditionally focusing on leisure travellers, Ryanair entered a huge and virtually unlimited market. Today, there is additionally the trend that price conscious business travellers prefer LFAs like Ryanair for flying. McWhirter (2000) estimates that about 40 per cent of the passengers who are using LFAs are away on business. By making flying a real bargain Ryanair created new markets, made up of people who previously would not have considered to take an airplane as means of travelling. In the early 1990s Ryanair started out local in the UK and Ireland and only by 1997 set out to conquer the mainland European market. In that year they started to offer connections from London to Paris, Oslo, Brussels, and Stockholm. In the following years more and more destinations were added and today Ryanair serves 55 cities on continental Europe on direct routes from London. Successful cost reduction strategies enable the company today to redefine European airline cost structures and floors and consistently provide the lowest prices and best value to its customers. Ryanair is the most cost efficient scheduled airline carrier operating in Europe today (Lawton 2002). For 15 years now, the airline has annually increased its number of passengers and total revenues and has also increased profits every single year except for 2004. Today the Dublin-based company has the lowest fares and lowest costs in Europe and was voted best European airline for passenger growth, European routes and bases, and customer service delivery. By the year 2004 with over 27 million passengers, Ryanair has become Europe’s second largest airline in terms of passenger traffic. It has even outperformed traditional airlines like British Airways, Air France, or KLM. Ryanair, which is today listed on the stock markets in London, Dublin, and New York, is a unique European success story in the airline business. The next section of the paper will discuss the factors that make this airline so distinct and will try to point out why it could have been so consistently successful over such a long period of time. The Ryanair mission statement, formulated in 1997, makes clear the ambitious drive for success in the market. The question which will have to be answered now is what strategies the airline employs in order to achieve this goal. According to Lawton (2002) Ryanair’s recipe for success can be captured in the simple equation “lower fares = more passengers = lower costs = lower fares” As already pointed out above, the business model is modelled closely after that of Southwest Airlines. Southwest founder and former CEO Herb Killeher once said that “Ryanair is the best imitation of Southwest Airlines that I have seen”. Even though many variations of LFAs exist today, it is widely accepted that the Southwest and Ryanair approach is the archetype LFA model. As described by Lawton (2002) the Ryanair low cost/ low fare model is reliant on eight distinct strategies. Definition: Low Cost Carrier, taken from www.answers.com. According to a report by the Civil Aviation Authority (CAA 1995). 1997 was the year when the airline business in Europe was finally fully deregulated. Please refer to Graph 1 in the appendix of the thesis. Official Ryanair mission statement taken from www.ryanair.com. Quote taken from Business Week, May 14, 2001.